Fantasy Flight Games gives us a Boxing Day treat and lets us know how fleet building works in their upcoming Star Wars Armada miniatures game. They're showing off how the different ship cards can turn one ship into potentially many different ones, depending on what extras you add. 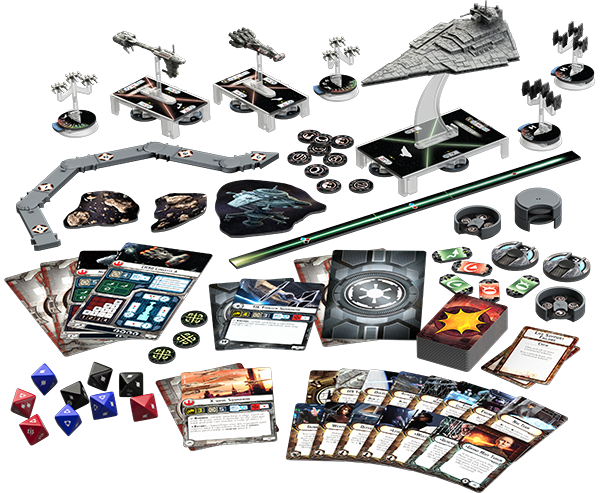 Much like their X-Wing minis game, they've got crew and upgrade cards as well. Included along with that, you've got fleet commanders that turn one of your capital ships into your Flagship. The thing that sets Armada apart is the fact that you have to also purchase three Objectives for your fleet. Check it all out in the article. The Star Wars galaxy is vast. Thousands of space-faring species inhabit millions of worlds. Their diversity is expressed in their technologies, philosophies, and attitudes, and in Star Wars™: Armada, rules for fleet-building allow you to bring a degree of this diversity to your strategies. For starters, in Armada, a starship isn’t just a starship. It’s also a weapon that’s wielded by the pilot who flies it or the crew that operate it. It can be enhanced with weapon upgrades, reinforced hull plating, and better comm systems. You might improve your command ship by outfitting it with an expanded hangar bay, or you might simply improve its performance by hand-picking all your crew members from the most elite talent available. In Armada, your fleet isn’t just the collection of miniature starships and fighter squadrons that you bring to the table; you also bring a collection of cards that define how your starships will function. These include ship, squadron, upgrade, and commander cards. Each card has a fleet point cost, indicated by a number in its lower right corner, and in a standard game, you and your opponent can each spend up to a total of 300 fleet points. If you spend fewer fleet points than your opponent, however, you can determine who will have initiative as the first player. You need a ship card for each ship you bring to battle. Your choice of ship card for a given miniature will impact both its abilities and its weight in your fleet. As noted in our preview of the game’s fighter squadrons, each squadron can be fielded as a non-unique collection of starfighters, or as one led by an ace pilot. Your decision impacts the abilities, defense tokens (if any), and fleet cost of your squadron. Upgrade cards come in all forms. You have weapons upgrades, comms upgrades, and crew upgrades, and each ship in your fleet comes with an upgrade bar that indicates what sort of upgrades you can attach to it. For a modest investment of fleet points, each upgrade card introduces a new ability that allows you to customize a ship to better fit into your overall strategy. Each fleet needs a commander. Your commander is a special type of upgrade card, and you must assign one commander to one of your capital ships. This ship then becomes your flagship. You can only have one flagship in your fleet, but it can be any of your ships, regardless of the upgrade icons on its upgrade bar. Then, so long as your flagship remains intact, your commander bolsters your fleet with a powerful and unique ability that you’ll do well to incorporate into your strategy. The Core Set comes with two commander cards. Grand Moff Tarkin bolsters an Imperial fleet by assigning an extra command token to each of its ships at the start of each Ship Phase. Rebel commander General Dodonna, on the other hand, ensures that the faceup damage you deal your enemies will be as impactful as possible. As you select the specific ship and squadrons that you’ll add to your fleet, along with any upgrades that you intend to use, you begin to form the outline of a larger strategy. As you change your selections, this outline changes. Accordingly, even with a limited number of ship miniatures, you can field an impressively diverse assortment of fleets, each of which may pursue its own strategy in battle. Your selection of ships and fighters to fly into battle isn’t accompanied only by your decisions of how to upgrade them and who to assign as commander. There’s another, critical step to fleet-building in Armada. Along with its ships, fighters, and upgrades, your fleet must include three objectives. These add variety to each battle by providing a narrative for why your fleets are fighting each other. Importantly, they also change how you score points, so you want to make sure that your choice of objectives fits into your overall strategy.